Predicted increases in temperature will likely lengthen the growing season (which is a good thing) and increased crop production may be possible in northern regions where suitable soils exist. However, higher temperatures and lower soil moisture may ultimately have a negative effect on dryland agriculture. It is moisture that could be the limiting factor for agricultural production on the prairies. Most climate change scenarios suggest that the semi-arid regions of the Prairies can expect an increase in the frequency of drought (1). This means that southwestern Manitoba may become drier overall. 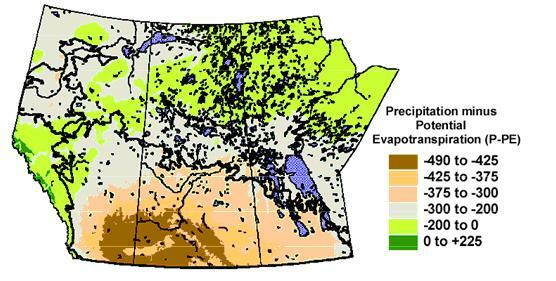 Many computer climate models predict average annual precipitation to increase slightly in the arable regions of Manitoba. However, this gain is offset by higher temperatures that increase evaporation – thus increasing moisture deficits. The moisture deficit area projected for the middle of this century extends over most of the cultivated land in Southern Manitoba and is worst in the southwest corner of the province (2). Figure 1 shows the projected moisture deficit for the Prairie Provinces in the decades 2040-2069. This map is drawn by the Canadian General Circulation Model scenario CGCM1. Notice that Manitoba may become less dry in the northeast. The extra heat could also increase the potential risk of insect, weed, and disease infestation, because warmer temperatures allow pests to thrive, rather than die-off in the cold (3). We need to build the adaptive capacity of rural areas. This strategy will require some government policy changes and some changes that producers can bring about on their own.